Industry Experts has introduced an unique and most detailed market research report on High Intensity Sweeteners. The new report titled ‘Global High Intensity Sweeteners Market – Artificial and Natural’ reveals that Asia-Pacific is the leading global volume market for HIS, which is forecast to be 75.3 thousand metric tons (48.5% share) in 2017 and is projected to reach 88.9 thousand metric tons by 2022 to reflect the fastest CAGR of 3.4% between the two years. In terms of product, global demand for HIS by type is the largest for Sucralose, forecast to be US$619.1 million (26.6% share) in 2017, which is expected to maintain a 2017-2022 CAGR of 2.1% and reach a projected US$833.4 million by 2022. High intensity sweeteners, which are many times sweeter than sugar, are widely used as alternative sweeteners or sugar substitutes because they contribute only a few to no calories when added to foods and beverages. Growing concerns about obesity and health concerns such as diabetes and heart disease associated with the consumption of sugar and other caloric sweeteners have caused consumers to seek healthier alternatives, including low-calorie or zero-calorie sweeteners in foods and beverages. Though artificial sweeteners occupy major share of the pie in high intensity sweeteners market currently, natural high intensity sweeteners are expected to register the fastest growth. Growing health concerns associated with the artificial sweeteners such as aspartame and saccharin are driving consumers’ interest in natural sweeteners. Steviol glycosides mainly drive the growth in the natural high intensity sweeteners space followed by monk fruit extract mogroside V in the near future. The growth of high intensity sweeteners in developed countries in North America and Western Europe has slowed down owing mainly to decline in soft drink consumption. But high growth in emerging regions such as Asia-Pacific and Middle East & Africa is expected to continue. 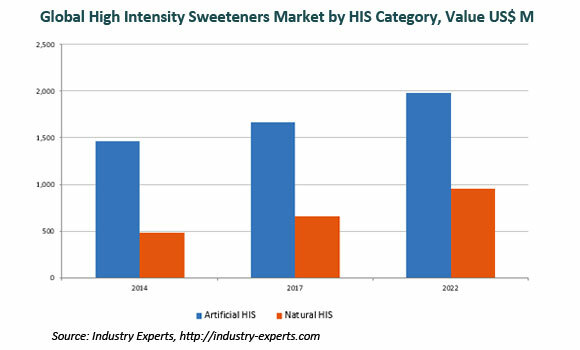 High intensity sweeteners (HIS) analyzed in this global market report is segmented by HIS category – Artificial HIS and Natural HIS. Artificial HIS analyzed in the study include Acesulfame-K, Aspartame, Cyclamate, Neotame, Saccharin and Sucralose. Natural HIS analyzed in the study include Steviol Glycosides (stevia extracts), Glycyrrhizin (licorice root extracts) and Mogroside V (monk fruit extracts). The study also explores the key end-use applications of high intensity sweeteners including Beverages, Confectionary, Foods, Tabletop and Others (personal care, pharmaceuticals and nutraceuticals etc.). The global value market for Artificial HIS is the largest, forecast to be US$1.7 billion (71.7% share) in 2017, which is expected to maintain a 2017-2022 CAGR of 3.5% and reach a projected US$2 billion by 2022. During the same period, global value demand for Natural HIS is slated to register a considerably faster CAGR of 7.8% and reach a projected US$958.8 million by 2022 from a forecast US$657.7 million in 2017. The global markets, including North America, Europe, Asia-Pacific and Rest of World, for the above mentioned high intensity sweetener categories, types and end-use applications are analyzed in terms of both volume in metric tons and value in USD for the 2014-2022 analysis period. The regional markets further analyzed for 15 more independent countries across North America – the United States, Canada and Mexico; Europe – France, Germany, Italy, Spain, the United Kingdom and Russia; Asia-Pacific – China, India, Indonesia, Japan and South Korea; and Rest of World – South America, Middle East & Africa and CIS Countries. The market is analyzed in all of these major regions by HIS type, key countries and by major end-use applications in terms of both volume and value. This report also provides the comprehensive market analysis of each HIS type by geographic region and end-use application while each end-use application market is explored against HIS types and regions. This 708 page global high intensity sweeteners market report includes 1053 charts (includes a data table and graphical representation for each chart), supported with meaningful and easy to understand graphical presentation, of market numbers. This report profiles 28 key global players and 96 major players spanning in North America – 19; Europe – 9; Asia-Pacific – 66; and Rest of World – 2. The research also provides the listing of the companies engaged in manufacturing and supply of high intensity sweeteners. The global list of companies covers the address, contact numbers and the website addresses of 167 companies.